Hello and welcome everyone to this edition of Graps and Claps this time taking me on a short journey to the Piccadilly area of Manchester for Futureshock Wrestling’s Tapped III event at the Fairfield Social Club for what will be in the first in a line of special Wednesday night events which seems a regular thing now in the British Wrestling sphere with many a midweek show taking place up and down this land, with the now defunct Lucha Forever being the innovator of said ‘midweek graps’. 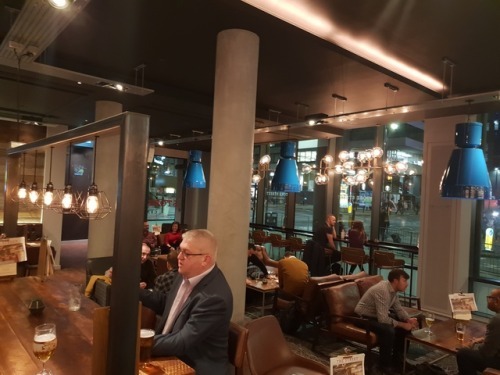 Getting into Manchester for 6pm, I swiftly made my way to The Piccadilly Tap to meet up with some of the Graps gang (Steve, Ben, Andrew and our Geoff) for a couple of pints before walking around the corner to the venue. 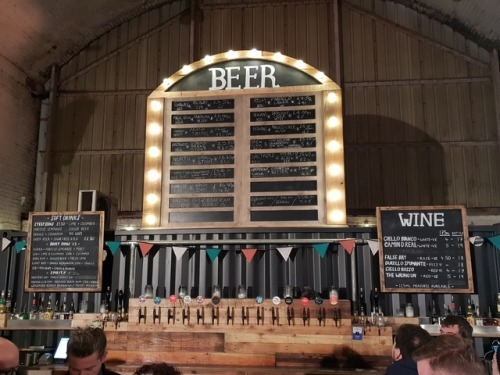 Only two pints before the show which included in the Piccadilly Tap – a pint of Marble/Heart & Craft Macchiato Porter (5.1% £5.80) that smelt coffee like but only tasted a smidgen like it’s supposed flavour which was maybe cancelled out due to it being a cold keg drink. It was then a walk across the road to the Store Street Craft Beer Bar which is adjoined to the Double Tree by Hilton, so it is basically a glorified hotel bar offering supposed ‘Craft’ beer from Brightside Brewery and JW Lees plus the usual Craft legends called Foster’s and Heineken – they will literally stick the word ‘Craft’ to bloody anything nowadays. Anyways the £4.60 pint of Brightside IPA passed as a solid 6.5/10, but I did feel sorry for Ben who bought a £6.50 pint of Goose Island IPA which is an example of hotel bar prices. Décor though in this place is welcoming but it is certainly one place where you would only visit to have 1 pint and nothing else if especially you are on your way to the Apollo as it is very sparse in good pubs on that route. Drinks done, it was time to get to the venue – whilst on the way my mate Andrew was telling me about a recent Kaiser Chiefs gig he had been to that wasn’t all it was cracked up to be with lead singer Ricky Wilson having a reet bad night on the mic. Arriving into the Fairfield Social Club I would estimate the audience to be around the 150/200 marker with many people taking in the fantastic ale selection (around 16 on tap on this evening anything ranging from £3.50 – £6 a pint), plus the food selection from Vasos Kitchen offering fries with different Indian style toppings including a Keema Option for £7.50 and a Masala option for £4 that I frequented – very fragrant in smell and a taste that certainly packed a punch but was well worth the price to fill a corner in my tummy! Taking our seats at the back near the commentator’s desk which wasn’t being used, as Rob Halden and Matthew Richards decided to do their commentary from the couches near the bar watching on monitors from G-Man video editing lair – probably the best option as our singing would have deafened their ears in the first match between Angst Strongman – Big Joe and one of our personal favourites Sugar Dunkerton who was making his debut in Futureshock in what was if I am right in thinking – his 1 year anniversary wrestling in the UK since his debut on a cold Leeds Afternoon. Early on in this match there were many chants aimed at Joe’s stature and also the Sugar chant was in full force thanks to his adoring fan club (us lot) meaning that his debut instantly got off to a great start with this response. As we eventually got into the action, we had Joe showing off his strength as Squatted Sugar but in turn after 3 squats, Sugar had him locked in a sleeper which left Joe laying on the floor. This lead to Sugar trying to quieten the crowd so he could pin Joe whilst he was asleep, but a big shout from the Nordic Alarm Clock on the outside woke Joe up at the two count. Once Joe was back awake, he laid a beatdown to Sugar but Sugar was only playing possum during this as he fired back with a Pimp Slap to Joe then a DDT for a 2 count. As the match reached its conclusion Joe used his strength to power up Sugar to hit a fireman’s lift then a Vader Bomb for a 2, but when he went to the other side of the ring to hit a splash, Sugar rolled to the other side of the ring and offered Joe to jump anyways which he duly did after much persuasion from Thomas Wolfe on the outside and Sugar inside the ring, sadly for Joe there wasn’t enough distance on the dive and no water in the pool as he went SPLAT! Sugar took advantage of this by rolling up Joe for the 3 count to get the popular victory to start proceedings. In terms of Comedy style wrestling these two were a match made in heaven with the charismatic Sugar and the ever improving Big Joe who has his character down pat – just all around entertainment that you can’t ask much more of! Second match now with the Futureshock Women’s title on the line with a clash of goodies as the Champion, Lana Austin took on her protégé of sorts – Hollie who was looking to possibly get the shock victory and maybe a championship by the end of this match even in her early infancy as a wrestler. The early feeling out process ended up with Hollie getting the best of it, but once Lana got into her stride she did so with hard forearms to the face. Hollie though came firing back with a couple of knee shots to get near falls. 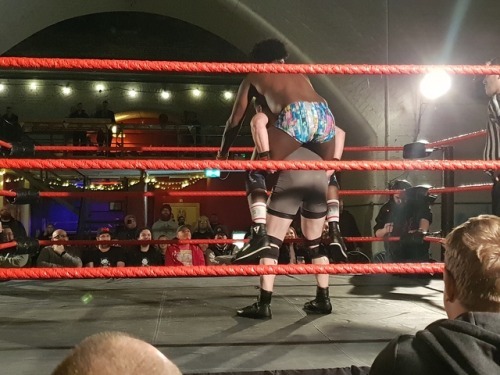 As the match was going on though, out came two newcomers to Futureshock (but already two regulars in WrestlePro), that being Alexis Falcon and Taonga who came to keep a watching eye, but they would soon get involved by attacking Lana from behind as the referee wasn’t watching. When they chucked Lana back in, they willed Hollie to pick up the scraps but her conflicting head got the better of her as she refused to pin Lana so instead Taonga and Alexis took offence to this and came in the ring to attack both Lana and Hollie to cause the No Contest – BOOOO!!! 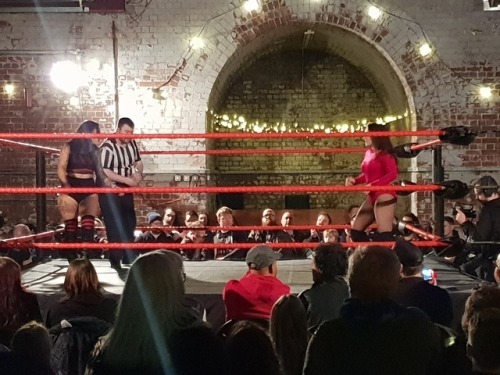 So it looks like we have a possible tag match for a future show with Hollie & Lana taking on Taonga and Alexis Falcon which is a good thing to see as it is a change from the monthly Queen Bees vs Lana & Partner match we have got often in Futureshock recently. Match wise with Lana and Hollie it was a decent follow up from the first match and hopefully we possibly get to see it again in the future. A special bonus match now as the sirens rang out in the Social Club with the appearance of the Futureshock Champion Crater, much to the disgust of some in the crowd (my friend Mike especially). 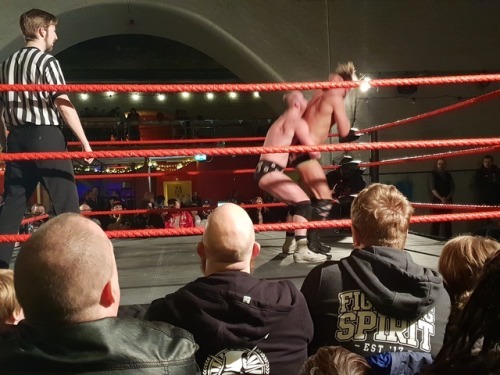 His opponents for the evening were not 1, not 2, but 3 opponents with the appearance of Karl Stoxx, Tom Thelwell and PCW favourite Philip Michael who got a good reception from the crowd even though this was his debut in the promotion – probably due to his familiarity on the North West scene. Sadly, though for the three lads, it didn’t turn out great as Crater smashed his way through them in quick style, despite them getting in little offence like double dropkicks to try and knock the big fella down. Crater soon finished it by hitting a double choke slam to 2 of them and putting a foot on the other to bring an end to proceedings. After the match though we had an appearance from Crater’s nemesis Henry T. Grodd who came out to spear Crater to the chants of ‘Grodd! Grodd! Grood! to once again stake another claim to a title shot against Crater in the future. To be honest though I do feel at this stage that the crowd are certainly behind a Grodd victory against Crater more than a John McGregor one! Half time Main Event now, with The Young Guns (Ethan Allen and Luke Jacobs) taking on the makeshift team of Sam Bailey and James Drake – this was due to Zack Gibson being unable to compete due to Injury. 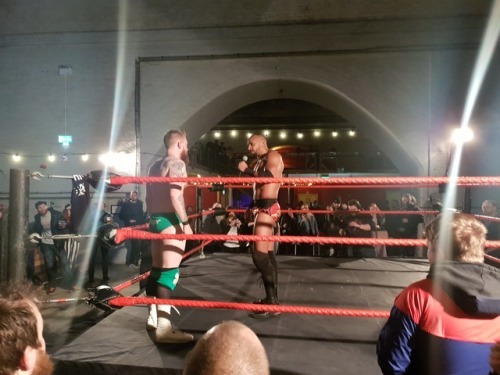 Gibson though did get on the mic before the match to explain why people were asking – Why are Gibson and Drake friends again in Futureshock after a 9-month feud? To their credit they explained it as more of a friendly tiff between great friends/colleagues – which I am glad they have explained it (They must have read my comments about the lack of explanation at the Stockport show). Just to report – no chants of ‘NXT’ on this occasion! They did promise the Guns though in the future that they would eventually get a match against the Grizzled Young Veterans with possibly some gold on the line – but we shall just see! Anyways with Gibson’s chatting out of the way, we got down to business with the Young Guns on top early with Jacobs first working on Bailey, then dissecting Drake. Ethan Allen then tagged in but was soon beaten down by both Bailey who hit a big superplex to young Ethan and then Drake followed up on Ethan with a Back Breaker to the boos of the crowd. The continuous beat down carried on to Ethan, that was until he got the hot tag to Luke who came in like a house on fire flooring both Bailey and Drake. It was interesting to see during this that Ethan was selling excellently on the ring apron from the beating – just the little things like that shows that this lad could be headed to the top. With Ethan back to full health, himself and Luke hit a Big Back Cracker double team to get a 2 fall, also in the home stretch we had Drake & Bailey hit their version of the Vets finisher which I will name for the purpose of this occasion – ‘The Ticket to Bailey’s House’ for a 2 count. With the Guns on top though, Luke was ready to finish off James Drake, but from behind Zack Gibson waffled poor Luke to leave him in prime position for Drake to hit the 450 to get the win in a fantastic tag match, but sadly for the Guns another one in the loss column – which I do hope for their sakes they can pick up some wins soon! Back from the break, we returned with Adrenaline Title action with No Limit after CJ Banks and Joey Hayes (Champion) went to a 15-minute Time Limit draw in Stockport, which has led to this match where the winner of the match will then go on to face Chris Ridgeway in Prestwich on the 23rd February. The early bulk of this match was CJ showing his dominance beating down Joey, including winning the best of the exchanges on the outside as they fought near the bar. Back in the ring though, both Joey and CJ went hold for hold for a good 20 minutes, that eventually ended in both guys’ double pinning each other much to the annoyance of the crowd who wanted an outright winner – so for the Prestwich show we now have a Triple Threat match with CJ vs Joey Hayes vs Chris Ridgeway for the Adrenaline Title. Couple of things to point out from this match, included a post-match beat up of Joey from CJ, plus my overriding opinion of this match the day after and also on the evening, was that this was a good wrestling match but it did suffer from crowd heat and not one to be a toss as I am not a wrestler, but this always seems to be CJ Banks downfall as a baddie – when he is on the offence especially as he was against Joey, he doesn’t attempt to jaw jack with the crowd to get them to boo him, he just goes straight into the next manoeuvre with no response. CJ is a good wrestler but he is as bland as anything. Second to last match as the time was coming up to 9:30pm and with our Geoff wondering if he should go home as he had work at 6am in the morning, but he decided against this. 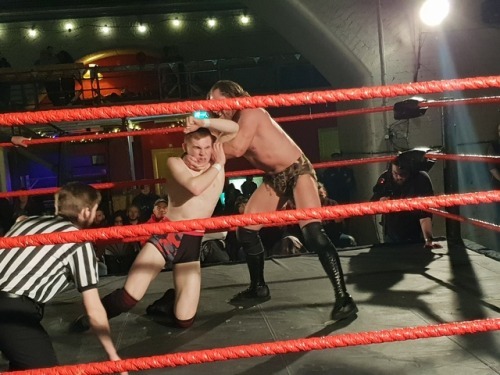 In this match we had two up and comers on the North West scene with JJ Webb taking on Callum Corrie, with the latter trying to making 2019 his own, like he did in the latter part of 2018 in GPW. Corrie had the bulk of the crowd noise for him with chants of ‘Sandy Beach’ and ‘Callum Corrie’ blaring in his ears and it was this support that got him over the finish line in this match as he hit poor JJ with a DDT to pick up the 3 count in a good under 10-minute scrap that kept the audience’s attention throughout the match. After the match though, this loss got too much for JJ who attacked Callum and then locked in a Crab to make Corrie moan like buggery, so this feud is going to continue so happy days as these are two good young up and comers. Main event time now with John McGregor trying to prove he has what it takes to dethrone Crater in March, by testing himself against former Futureshock Heavyweight Champion Ashton Smith who was looking himself to get back on track after a quiet couple of months in the promotion due to WWE commitments – plus as ever it was good to belt out a rendition of ‘All of the Lights’ once again as Ashton made his way down to the ringside area. A bulk of this match was very much Ashton being the aggressor as he beat down the much smaller McGregor, but John over these last couple of months is showed those fighting qualities from underneath that helped him win the Legacy Tournament, especially his match vs Zack Gibson where he was excellent. With John fighting through, he looked like he was ready for the loss as Ashton hit a GTS then a ‘Roll of the Dice’ for an agonising 2 fall that had the crowd on the edge of their seats but John managed to somehow recover from this as he hit a Jumping DDT to Ashton to get the 3 count in around 15 minutes in a very good main event. After the match though, Ashton got on to the mic to say to congratulate John on the win, but then the pleasantries stopped at that when he said bluntly to John that ‘You are not ready for Crater off that performance’! – Which instantly I think puts in the crowd’s head that the Gentleman is not good enough to beat Crater in March, but this writer though thinks differently and can see him pushing Crater all the way, but with the threat of Grodd I can see John ultimately failing – we shall see!! Show done, it was time to leave but not before having a quick chat with Ashton, ring announcer Neil and also Sugar Dunkerton who as ever was a gentleman to chat to. 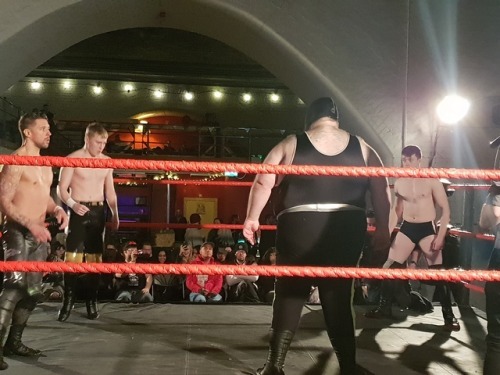 Overall as a show it was a good 2 ½ hours of entertainment with the Young Guns vs Sam Bailey/James Drake, Dunkerton/Big Joe and the Main Event being matches you should check out on Futureshock’s On Demand service. Next time we will be at Futureshock will be the 23rdFebruary in Prestwich for the visit of PAC who will be taking on Soner Durson. Next time you will be hearing from me will be for Breed Wrestling’s debut show in Sheffield on Sunday 10th February – so as ever go and give this a share, likes and retweets and spread the word. So until then – BYE !!! !